For many years, decades in fact, New York has been seen at the must-have destination in America; though it was the preserve of state airlines and large US carriers for many years too. In 1972 British Caledonian achieved what all others had failed to do, they secured scheduled services to New York, Los Angles and Chicago. Though world aviation was just about to fall off a cliff, with rising fuel costs, falling passenger revenues many airlines found it hard going. Court Line and Donaldson collapsed and all airlines looked to cut costs. BCal staff cuts came on the back of a £4million loss in 1974 as savings had to be made. The hard won scheduled transatlantic services were also stopped on 31st October 1974, a particularly bitter pill to swallow. By their closure, 96,000 passengers and 2,675 tons of freight had flown on the New York service with 52,000 passengers and 1,118 tons of freight on the LA run. No one at that time anticipated that it would be over a decade before BCal were able to resume scheduled services to New York. Though BCal flew many charter services and contract flights to New York and Los Angeles in those 10 years. In 1977 alone, 50 flights were flown to New York and LA for Jetsave Holidays. Laker Airways were recognised as the 2nd carrier to New York alongside British Airways in the Bermuda II bi-lateral flight agreements between the UK and US. But Laker collapsed in 1982 after another debilitating round of fare cutting over the Atlantic by many carriers, seats being sold below the cost of the fuel is never a good policy, Braniff also collapsed. BCal applied to resume services to LA and New York. Eventually BCal were granted a permission to resume scheduled services to New York, and they started on 1st May 1985 when BCal DC10 G-BHDI flew the inaugural service of the second chapter. Soon after BCal 747 G-HUGE would be transferred on to the premier route. The New York service was given the backing of a new campaign, this time one based around the iconic New York New York. There was also a TV commercial to go with it, and we have a copy of that below. The British Caledonian "New York New York" TV commercial was so successful people started to go out and look for the single, New York New York. 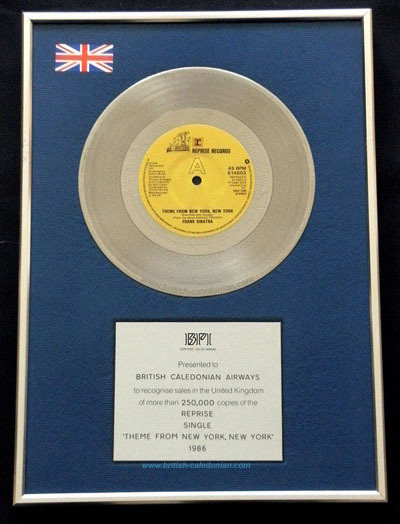 The song was re-released and in 1986 British Caledonian were awarded with a Platinum Record Disc for sales of over 250,000 copies of New York New York. Im not sure how many other airlines, past or present, can say that they had a chart topping hit.....but I know one that did !